Konge af Böhmen, Tysk-romersk kejser af huset Habsburg. Blev efterfulgt af sin søn Ferdinand III. 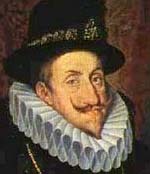 Ferdinand II, Holy Roman Emperor (July 9, 1578 - February 15, 1637), ruled 1620-1637. Originally Archduke of Styria, his appointment as King of Bohemia was one of the causes of the Thirty Years War. He was the son of Karl II of Austria (1540-1590) and his wife Maria Anna of Bavaria (1551-1608). He was the leading champion of the Roman Catholic Counter-Reformation and of absolutist rule during the Thirty Years' War. His first wife was Maria Anna of Bavaria (1574 - 1616), by whom he was father of four children, including Ferdinand III (1608-1657). His second wife was Eleonore of Gonzaga (1598 - 1655).